Be “distinguishable”, which basically means it can’t too closely resemble an existing business name in the state. First things first, you’ll need to do a business name search. Head over to the Colorado Secretary of State website to check your name’s availability before you go any further. In addition to securing your business name, I also recommend reserving a domain name to serve as your business website. You can check if your ideal URL is available through GoDaddy! Electing a Colorado registered agent is an essential part of starting your new corporation. This certified CO resident or registered business entity will act as the representative for your business and receive service of process notices, tax forms, and other legal documents on your behalf. You must be a permanent resident of Colorado. You’ll have to release the corporation’s address, so if you run the business from home your personal address will be on public record. You must maintain normal business hours (9-5, M-F) at your listed address. You’ll risk being served in front of friends, family or coworkers. Read through our registered agent guide if you’re contemplating taking this task on yourself or handing the reigns to a business partner. That said, we highly recommend looking into hiring a professional registered agent. The best and cheapest way to go about this is through an incorporation service like Incfile. They offer a year of free registered agent services when you form your corporation with them! Colorado requires you to file online through the Secretary of State website, which makes the process considerably easier. You’ll even take care of the $50.00 filing fee digitally! Filing your Articles of Incorporation isn’t super complicated, but there can be repercussions if it isn’t done properly. For this reason, we encourage everyone to look into an online incorporation service for this step. Using a professional filing service is a mess-free way to ensure that your paperwork is filed correctly, leaving you more time to focus on other areas of your business. Next up, it’s time to apply for an EIN. An EIN, or Employer Identification Number, is a unique identifier for your corporation that will allow you to set up a business bank account, hire employees and file state/federal taxes. You’ll also need an EIN to file many additional government forms, including Form 2553. This is the form you’ll file with the IRS if you’re hoping to apply for S-Corp status. Essentially all corporations are required to have EINs, so it’s a good idea to get it out of the way as soon as possible. The good news is it’s a fairly simple process -- you can apply free of charge through the IRS Website. Obtaining an EIN is one of the easiest steps in this guide, so we recommend simply taking care of it yourself. If you apply via the IRS online application, you’ll receive your 9-digit EIN as soon as you’re finished. If the online approach isn’t really your style, check out our EIN guide for additional ways to get an EIN for free. If you haven’t already, it’s time to appoint at least 1 director who will oversee your corporation, at least until the first shareholder meeting takes place. Colorado’s business statutes don’t state a specific number of directors you’re required to appoint after that, but the standard is 3. This organizational meeting is a huge step in the life of your corporation, so it’s important to go in prepared. I recommend taking advantage of meeting minute and bylaw templates if you’re unfamiliar with these types of documents. 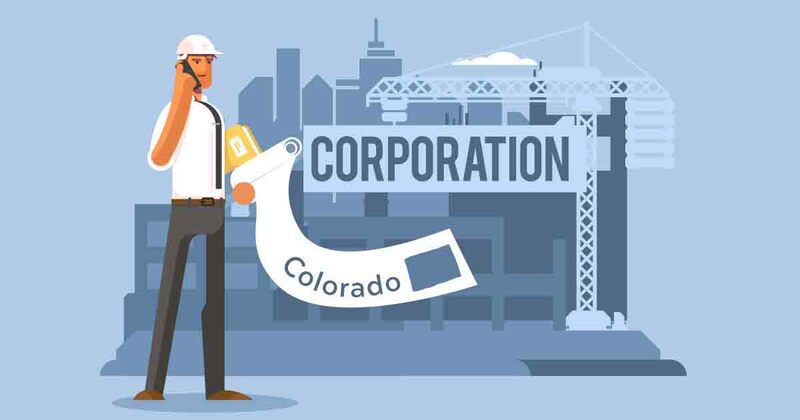 Also, it’s always a good idea to read up on any corporation requirements you’re not sure about by reviewing Colorado’s revised business statutes. … and any other essential forms you’d be kicking yourself if you lost. There are a few ways to go about crafting a records book for your corporation. We’re huge fans of corporate kits, which include some special extra pieces like a custom corporate seal and printed bylaws to convey the legitimacy of your company. These are also great because you can simply tack them onto your incorporation package if you’re planning on using their services anyway. However, if you’re not concerned about having any customized pieces and you’re just looking for something sleek and simple, you could easily find a nice leather binder at your local office supply store. The most important thing here is to keep everything well-organized. Opening a business bank account is one of the most important steps you can take to establish your corporation as an entity separate from yourself. Mixing personal and professional finances never ends well, so don’t make the mistake of running your business out of your own bank account. Each of these options offers something unique for new businesses, so take some time to look into their offerings to find out which one best suits your needs. That being said, it’s still important to make this decision fairly quickly as it’s the first step to building a solid financial foundation. Do some digging and find out exactly what features you prefer in terms of rates, customer service, small business perks, ATM accessibility, and so on. If you’re considering a national bank, check out our reviews of Wells Fargo or Chase to start your research. Once you’ve settled on a bank, it’s worth investing in some solid accounting software, especially if you’re not quite ready to bring in an accountant. We’ve ranked and reviewed our favorite accounting software tools, so when you’re ready, read up! Federal: The Small Business Association website has a bunch of helpful information on federal tax requirements and federal licenses and permits. The business taxes page on the IRS website is also an excellent resource. State: You can apply for state-specific permits and licenses via the CO Department of Regulatory Agencies. They provide a list of all professions that require specific licensing and will also direct you to the correct application and additional relevant resources. Local: For municipal tax and licensing requirements, contact your local chamber of commerce. Keep in mind that as a corporation, your business will be subject to corporate income tax, unlike LLCs which are considered pass-through entities. The corporate tax rate in Colorado is 4.63%. If you're feeling a bit apprehensive about this step, leveraging a business license service is a great solution. They’ll find out exactly what permits and licenses are required of your business on a federal, state and local level, as well as provide all the applications! Starting a corporation in Colorado is quite a task, and it’s easy to let things slip through the cracks. That said, it’ll be well-worth it in the end if you spend the time and money now to make sure that everything is done correctly.